Being a woman in Tudor Britain doesn't sound like much fun. You're surrounded by pompous, wealthy men in positions of immense power who seem to think it's their god-given right to belittle, demean and sexually harass you. Thank God we've moved on since then, right? 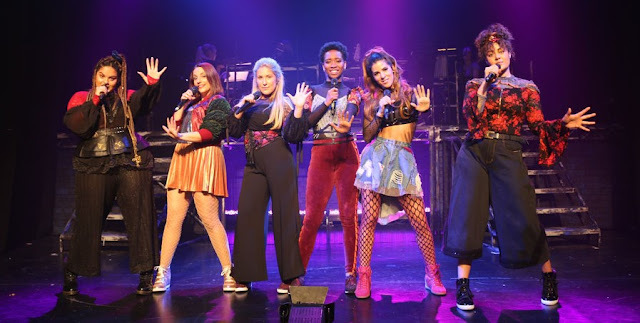 Toby Marlow and Lucy Moss's Six, a pop concert/musical starring Henry VIII's wives, would have been pretty great under any circumstances, but recasting their stories through a prism of contemporary misogyny and male entitlement slots neatly into the #MeToo movement. After all, what could be more relevant nowadays than the stories of women abused by a corpulent, bearded megalomaniac? The tale of Henry VIII's many wives is familiar to every British schoolchild, generally summarised as: divorced, beheaded, died / divorced, beheaded, survived. Traditionally they're portrayed as mere planets orbiting the star of King Henry, their fortunes judged by their impact they had on the Crown and State. Six takes a different tack, the Queens indignant that they're just "one word in a stupid rhyme" and eager to define themselves as individuals. From this grows the loose format of the night. Taking the form of a pop concert, the Queens vie with each other on who has had the most miserable life. Whether they ended their days under an executioner's axe (or in Anne's case, sword), wearing a penitent's sackcloth or of complications in childbirth each suffered various indignities courtesy of their mutual husband. 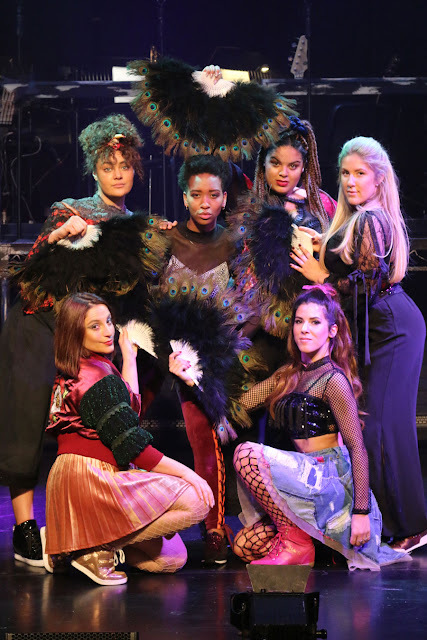 Things kick off with a bang as the Queens (Renee Lamb, Christina Modestou, Natalie Paris, Genesis Lynea, Aimie Atkinson and Izuka Hoyle) take the stage, dressed in pop contemporary costumes with subtle Tudor embellishments. Each Queen gets their moment in the spotlight to vie for the audience's sympathies, and each song aurally quotes (but doesn't quite parody) the styles of Katy Perry, Lady Gaga, Lily Allen, Beyonce et al. My toes were tapping throughout this brief n' breezy 70 minute show - there honestly isn't anything close to a dud number here. However, if I had to pick the songs I thought were particularly smile-inducing, I'd have to go with Genesis Lynea's Anne of Cleves' number, who overcomes the humiliation of Henry's public disappointment that she doesn't match up to her 'profile pic' to go off and live in a castle doing her own thing. Lynea positively brims over with charisma, and her Cheshire Cat grin as she takes her own throne is infectious. Also excellent is Aimie Atkinson's Catherine Howard, whose song is musically upbeat yet pretty damn depressing. Of all of Henry's wives she got a particularly bad deal, a 16-year-old married off to by this time obese, ulcer-ridden and possibly syphilitic 49-year-old man who lasted just 16 months as Queen before (quite understandably in my opinion) getting caught having an affair and quickly executed. Six portrays her as a typical teenager whose affections are manipulated by each man she encounters, each telling her they have a special connection as a way to get under her bodice. Atkinson gives a barnstormer of a performance, perceptibly sagging as the veil falls from her eyes. I could go on, but you're just going to have to take my word that the rest are also top notch. At times, Six genuinely felt like a musical tailored to my specific tastes. I love female-fronted pop, a bit of a history geek (handily for this show I recently finished Peter Ackroyd's The History of England Vol 2: The Tudors) and I'm a huge fan of the BBC's Horrible Histories TV show, which Six is obviously influenced by. Marlow and Moss are obviously a pair to keep an eye on, displaying enviable lyrical and melodic talent. Six quickly adds up to a genuinely exciting theatrical experience, assembling a seriously talented (and very well rehearsed) cast who're obviously enjoying themselves, note-perfect live musical accompaniment and a modest yet effective stage design. It feels as if everyone involved in this is going places - so check this out while you can. Six is at the Arts Theatre on 22 January 2018 (though I'd bet it'll return soon enough). Details here.